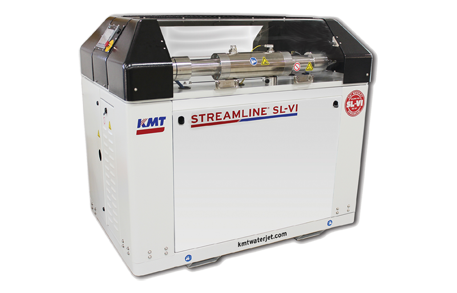 For application which do not require a maximum pressure of 4,136 bar, KMT WATERJET SYSTEMS offers the STREAMLINE SL-VI STD high pressure pump as a lower priced alternative still featuring KMT’s advanced pump technology. The STD models can be operated both independently as a stand-alone unit or communicating with the central control system of the entire cutting machine. 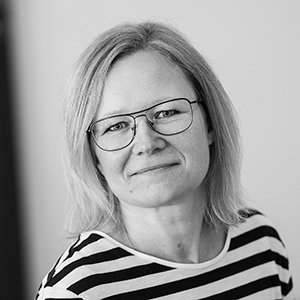 As both pump models SL-VI PLUS and SL-VI STD are based on the same technology and the same frame, operators of an STD pump can benefit from the advanced hi-tech design of the PLUS model. By choosing different configuration possibilities, the pump can be customized to fit the operator’s demands. 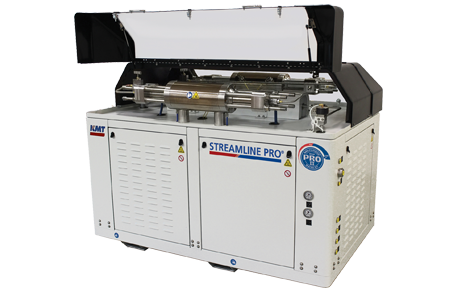 KMT Waterjet high pressure pump NL-I 40The NEOLINE NL-I 40 High Pressure Pump features KMTs proven and reliable SSEC intensifier technology in an affordable entry-level product, thus offering a great value at a reasonable price. It is the perfect solution for everyone who is looking for an economical waterjet cutting solution for occasional cutting needs using the best technology the industry has to offer. The NEOLINE pump has been developed with the aim of creating a robust, easy to operate pump. It is driven by a 40 hp (29 kW) three-phase motor which is equipped with vibration isolation pads to protect the rest of the pump from the motor activity. Furthermore, the NL-I 40 features a rugged powder-coated finish protecting the surface from environmental influences. For ease of operation, the KMT engineers developed a new low-profile cabinet design which grants easy access to the pump controls and other components.